Pro Tools users to experience the quality of everything we do at Stillwell Audio, and to enjoy the way we do it. Do you use a VST3 host? Ask no more, because now we've got you covered as well. We have a new website (did you notice?) and *tada* please bid welcome to Broadsword, our newest developer. Of course, by 'Everything' we mean 'not quite everything', because PsychoDither is not quite up to V3 (stand by for that!) and 'Microshope' has been discontinued. If Stillwell Audio was a greatest hits album, The Rocket would be track one. 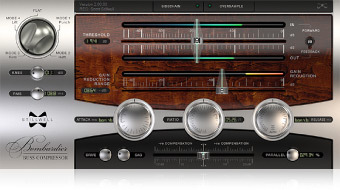 Lauded and beloved of VST and AU users, now also available as AAX and VST3 ...welcome to the party! Ultra-fast character effects compressor with ‘All Buttons’ ratio mode, sidechaining, and the ability to take the delicate, musical gain reduction to the extremes of dirty, heavy and slamming rock’n’roll misbehaviour. Now, about that website…that might take a bit longer. Our forums have been updated to a new platform, Discourse. We think you’ll like it a lot, and it’s easier to get on board than it had been before. If you had an account on the old forum, it’s been brought across to the new one along with all the old content, but you’ll need to reset your password before you can log in. You have probably already received an email asking you to reset your password. The new forums are linked from our main website, and the old forums disabled/set offline, but you can go directly to our new forums here at https://forums.stillwellaudio.com. This is the first step in a refresh of all of our online services, so don’t be worried if you see some occasional downtime. Next step is moving our support ticket site, and then finally we’ll get the main website moved and updated. Corrected issue where upgrading to Pro Tools 11.2 disabled stereo versions of plugins. Where factory presets existed for VST and other formats, they now should also exist for RTAS and AAX. VST3 factory presets for Windows didn’t make it into the previous release due to a build error – fixed. As always, this is a no-cost update, just download and install over your existing version. Always practice safe computing and keep backups, right? Here it is, our famous character compressor. And now ProTools users can join the party! Premium quality buss compressor, tailored for smooth and musical processing of complex audio. This is one of those mythical plugins that makes things sound better just by plugging it in. Really. Vibe-EQ is an equalizer that shapes the character of the sound; its is all about color. The more boost or cut you dial in, the more color and funk you get, in the form of rich harmonic variation of the frequencies you choose. A tribute to the utter transparency and smoothness of one of the greatest console equalizers of all time, featuring an adaptive midrange and a high shelf so musical you’ll scarcely believe your ears.